Our Vision: Transforming lives to become the heart, hands and feet of Jesus in the world. Our Mission: To serve and unite those we touch with the Grace of God. Take a virtual Tour of Grace United Methodist Church! Bird's eye view of Grace UMC, Nov. 3, 2016. Thanks to Kenny Frank. 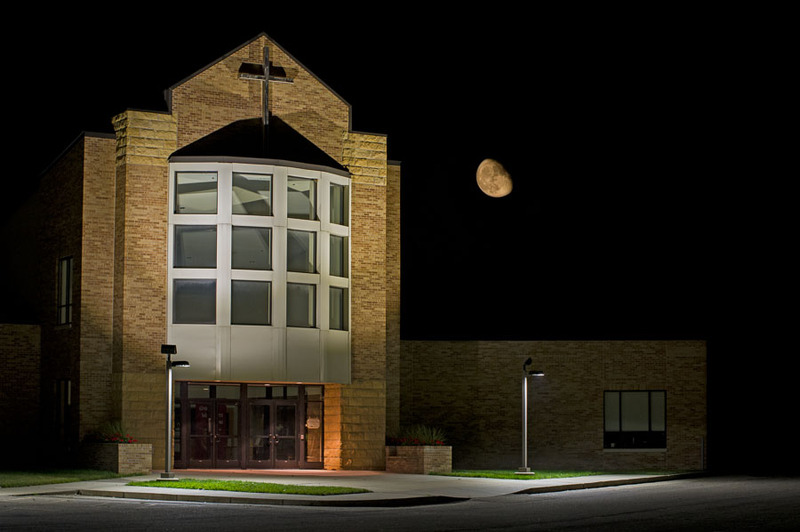 Grace UMC at night with a waning moon. Photo courtesy of David Mills-Rittman. The Minnesota United Methodist Conference published an article about the Grace UMC Lenten Series, “It seemed like an ordinary day until I had coffee with Jesus at the Café DuMonde.” Each Sunday during Lent a member of the congregation shared during worship a time when they had encountered Christ. Videos: You can watch two of the encounters with Christ as shared by members of Grace UMC.